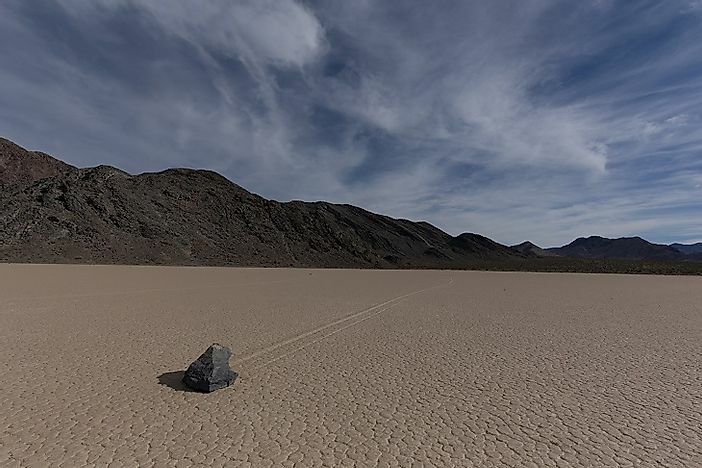 What Are The Sailing Stones Of Death Valley? Apparently moving by themselves across the desert, these rocks are likely being carried along by bacteria. A Death Valley stone on the move, leaving a mysterious footprint in its wake. A strange geological phenomenon which has baffled scientists for nearly a century, the sailing stones are the subject of much scientific research and investigation. The phenomenon involves the movement of individual rocks or stones on relatively smooth, horizontal, valley floors, inscribing long tracks on the floor without any visible external force inducing such movements. The movements of such rocks might be straight or be "zig-zag" in nature. The rocks with a rough surface tend to follow straighter paths than those with a smoother surface. The moving rocks often move parallel to each other and then might abruptly change direction moving sideways or even regressing back to their original position. The phenomenon of sailing rocks have been observed in various locations around the world. They have been extensively studied in the United States where they happen to occur most notably in the Racetrack Playa, Death Valley National Park and in Little Bonnie Claire Playa in Nevada. The phenomenon has also been observed in the Manchego lagoon in Altillo Chica in Spain. In 1915, the sailing stones of Death Valley were first documented when Joseph Crook, a mineral prospector, visited the site and detected the phenomenon. Since then, the sailing rocks have been extensively studied and several theories have been proposed to explain the phenomenon ranging from extremely bizarre theories to highly complex scientific explanations. A localized magnetic effect moving these rocks was one of the primary suspects. However, the absence of sufficient magnetic elements in the rocks and stones and their tendency to scatter in all directions instead of moving unidirectionally towards a possible magnetic field, disproves the magnetic theory. The influence of wind on these rocks has also been suggested but scientists have claimed that wind speed in the region was not sufficient to move the rocks, some of them heavier than an adult human being. The influence of ice and snow on the movement of the rocks was also suggested by scientists. However since no one had actually observed the rocks move, a conclusive evidence could not be reached, necessitating further research into the area. This began with the installation of a weather station in the Racetrack Playa and soon sophisticated instruments including several time-lapse cameras and GPS-embedded limestone rocks were placed in the region to record the mysterious movement of the rocks and stones of the region. A breakthrough discovery was made in November of 2013 when a team of American scientists witnessed the first recorded movements of the GPS- embedded rocks in the Racetrack Playa where the rocks moved at amazing speeds of 9 to 16 feet per minute. During this time, rainfall and snowfall in the Death Valley had caused a small pond to form near the southern end of the Racetrack Playa which cyclically froze at night and melted in the sun in the morning. At a crucial period in the day, under the influence of the sun, ice sheets broke apart to form massive floating sheets of ice that were only a few millimeters in depth. Driven by wind speeds of about 7 to 10 miles per hour, these ice sheets collected behind rocks, generating sufficient force to make the rocks move, leaving behind tracks on the muddy ground beneath them. The research findings were published in the renowned scientific journal PLoS ONE on August 27th, 2014, with the title “Sliding Rocks on Racetrack Playa, Death Valley National Park: First Observation of Rocks in Motion” and implied that only a perfect balance of the wind, sun, rain and snow could trigger such rock movements. Researchers from the Complutense University in Madrid, Spain, however, believe the sailing rocks of the Altillo Chica lagoon in Lillo have a completely different explanation. The new study which has been published in the journal Earth Surface Processes and Landforms claims that the rock movements are due to winter storms generating water currents that push forward the rocks along a surface colonized by microbes producing slippery substances. Since ice rarely forms in the salty waters of the Altillo Chica, the Spanish scientists ruled out the possibility of ice sheets inducing the rock movements in the region. Instead, they proposed that during winter storms in the region, wind flow created water currents of around two meters per second which stirred up the soil around the rocks in the region, creating grooves. Aided by the slippery substances secreted by the cyanobacteria and other microbes beneath the rock surface, the rocks were forced to move out of their positions, leaving behind trails of their movement. The strange phenomenon of the sailing rocks thus appear to have perfect scientific explanations describing the phenomena. Both the theories proposed by the American and the Spanish researchers appear to have significant strength and only time will reveal which of them is uniformly applicable or whether they are both applicable in distinct regions of the world exhibiting the sailing rock phenomenon.